VETERANS DAY OBSERVANCE - GCTC students and staff paused to honor all who have served in the U.S. military. 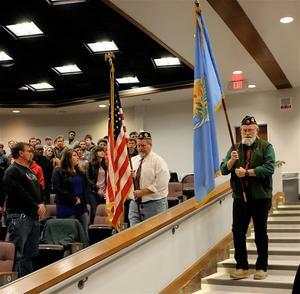 The GCTC Veterans Day observance was held Monday morning. 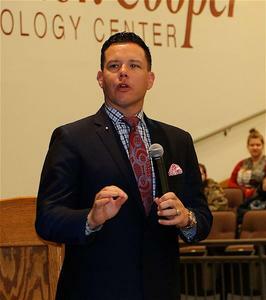 Keynote speaker Sen. Jason Smalley told students, "Our nation is built on the service of veterans." Sen. Smalley recounted his service in the Marines and encouraged students to consider the "amazing opportunities" available through military service. Even though this is a time of political division in our country, we can all take time to thank veterans, he said. Prior to the keynote address, children from the Shawnee Early Childhood Center led the Pledge of Allegiance along with several recitations. The children were directed by Rosanna Wassana. 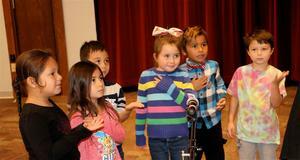 An ensemble of GCTC staff members led by Carolyn Daugherty vocalized the national anthem. The colors were posted by American Legion Post 16 Commander Jim Comrey and Tony Litherland. Here are some photos.